Captain Margaret Pommert is talking about diapers but there isn’t a woman in the room giving babies much thought. 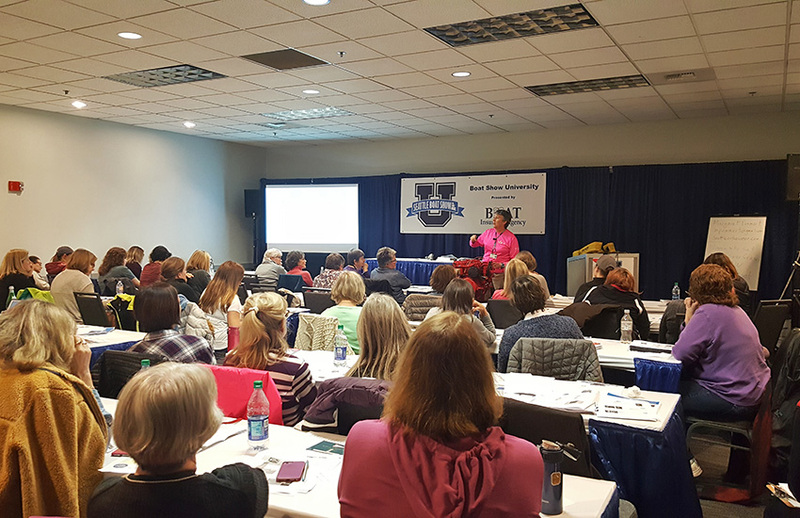 The attendees of this week’s sell-out Women: Dock, Diesel, Navigate, Crew Overboard Boat Show University course are focused on tips for diesel engine maintenance. Pommert continues to demonstrate oil changing techniques on a bright red engine as the diaper, a mixing elbow and several other parts are passed around the room. Captain Margaret Pommert shares her knowledge with a sold-out crowd! 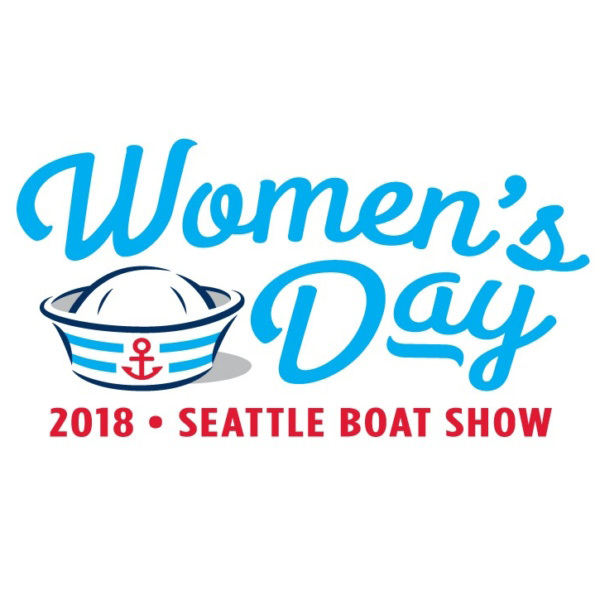 Now in it’s 12th year and taking place on January 31, Women’s Day at the Seattle Boat Show featured the all-day Boat University course designed specifically for female boaters. There were also free seminars with numerous female presenters and the day culminated in the Northwest Women in Boating (NWWB) panel featuring five women with diverse boating backgrounds and inspirational insights. In the last hour of the course, Pommert set expectations for messy but manageable diesel maintenance, demonstrated how to deploy the lifesling, and other considerations for crew overboard procedures. The room was at capacity and many women lingered to ask thoughtful, technical questions. Pommert’s co-instructor, Captain Linda Lewis told 48° North that the duo decided to dive deep into 4 main topics: docking, diesel engines, navigation and crew overboard to ensure the attendees had concrete takeaways. For docking and again for crew overboard, they split attendees into power vs. sail so they could address the specifics for each kind of vessel. Rachel Brody, owner of a 34’ CHB trawler, felt the course had a lot of good basics and presented a different way of thinking about some of the topics she already knew. Every woman’s path to the water is different but facing similar challenges builds camaraderie and collaboration. Some are drawn to boating both directly out of curiosity or a sense of adventure. Others find their way indirectly through another person in their life such as a friend, family member or partner. Another attendee, Pat Hitchcock became a boat owner with her husband twelve years ago. After ten years of working on their 1946 Seiner fishing boat, they are now playing on it. Hitchcock found the diesel engine discussion the most exciting. “It made me feel like, yeah, I can get down in the engine compartment and touch it, feel it” she said. Though she’s attended the Seattle Boat Show before, this was her first Boat University course and she found being among other women comforting from the very beginning. “We have a soft spot for women in boating, especially in the powerboat arena where stereotypes still dominate,” Lewis said. Genders aside, “if you only have one person on the boat who can handle the boat, you don’t have a safe boat” she concluded. Cara Kuhlman is a Seattle-based writer, sailor, and craft beer enthusiast. AND, she’s the proud new owner of a Catalina 34.